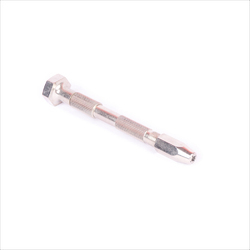 Pin Vice Screwdriver Type With Four Mouth consists handles reduced in size so that they can be rapidly rotated between thumb and finger when filing small work. Hardemed steel, length approximately 90mm, to hold insect pin with diameter 0-0.40mm. Very useful for dissection under microscope. • Ideal for Holding Small Tools. Rods. Wires etc. • Capacity 0 to .028". Item Code: DDRI-73-05 Hardemed steel, length approximately 90mm, to hold insect pin with diameter 0-0.40mm. Very useful for dissection under microscope. We are biggest manugacturers of Double End Pin Vise Silver, which is used to twist a wire. The quality and durability of this product has earned us a name in this market. Supported ourselves with proficient amenities, we are readily instrumental in providing an inclusive variety of 4 Mouth Pin Vice. By leveraging our extensive market knowledge, we provide the best quality assortment of Spiral Pin Vice. We are a coveted manufacturer, exporter and supplier of optimum quality gamut of Pin Vices. - For holding drill bits, reamers, needle files, screws, taps, wires etc. - Sliding pin vise features a sliding knurled ring to close jaws making it easy to operate. Mini pin vise features a heavy knurled brass body. This double ended pin vice will service your needs whether it is for watchmaking or jewelry design and repair. The Steel collet is set into hollow brass handle with screw chuck. It features a knurled grip and chrome finish. Used for holding small drills, wires, reamers & other miniature tools. Widely used in electronic assembly, tool making etc. There is a 3 jaw steel screw chuck and the plastic handle is unbreakable. - for holding wires, small tools , taps and drills etc. Collet pin vies This pin vise has two collets.